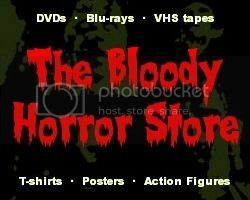 Contrary to what a Kentucky-based, former horror podcast which hardly anyone ever listens to anymore might like you to believe, I'm one Englishman who doesn't live in a dark basement surrounded by horror movies. Occasionally, I even leave my bright three-bedroomed house to work and buy things rather than ponce off my parents or welfare like they do. If you don't know what any of the above refers to, never mind. I only know what was said through hearsay too. I have no time for the two talentless "Laurel and Hardy" wannabes who thought they'd be the new voice of horror way back in 2007 (although they always add a least one extra year onto the time they've been around), but, having failed miserably, now just take jealous potshots at other horror fans who they don't really know to claw back some credibility as "shock jocks" or something. Did any of what they said bother me? No. "Dr Blood's Video Vault" has been around over a decade longer than they have and will continue to be long after they have disappeared back under the rock which they were stupid enough to crawl out from. They did give me something amusing to start this post off with though. Anyway, yesterday, I had another long overdue "Big Day Out". I'm sure my last one wasn't when I went to the County Fair over a month ago, but it certainly felt like it was. The seasons have changed, there's new stuff in the stores, and there were even a few things to buy at my local pawn shop. 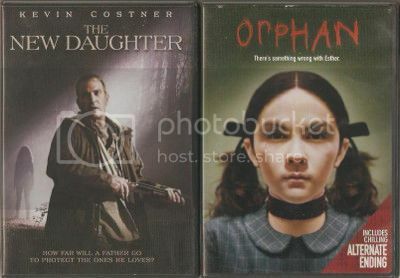 Finally, "The New Daughter" and "Orphan" turned up! I'd already hired them from Netflix and reviewed them favourably so I just had to have them. I'd never even seen "The New Daughter" for sale anywhere before but had picked up (and put back) "Orphan" several times in Target. At $2.50 each for immaculate DVDs (apart from slight security tape damage to the "Orphan" artwork), this was a done deal. Then to complete the "4 for $10" ritual, I saw that "Van Helsing" and "Whiteout" were still on the bottom shelf so I grabbed those too. I know they weren't exactly brilliant movies, but I'm going through a phase of Kate Beckinsale idolatry right now which, hopefully, these will dissuade me from. That wasn't all there was to my "September Outing" either. 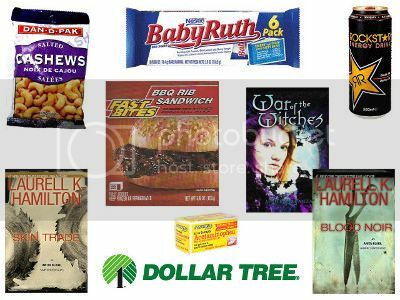 Once I discovered that I had more money in the bank account than I realised, I was off to "Dollar Tree" to check out all the Hallowe'en decorations and buy some of the foods I like which even dogs can barely stomach. I love their McRib clones! I didn't buy any of the neat Hallowe'en stuff since every day is Hallowe'en for me anyway, but I did get three books which I had no idea about. I'm not much of a reader, but I'll give them a go eventually. I've looked them up now and I know I'll be disappointed, but for $3, it doesn't matter. I also bought more chocolate and a pound cake, but I'm sure none of that interests you. I've bought enough snacks, drinks and sandwiches to least me for a little while now so my next "Big Day Out" will undoubtedly be just before Hallowe'en when my Aldi's $1.99 pizza supply runs out. Now it's back to the dark room that I allegedly sit in all day being very English and watching 3D movies. That's much better than wasting a fortune on non-celebrity autographs at horror conventions or trying (and failing) to sell poorly-designed t-shirts and lame movie commentaries to some braindead podcast followers, right guys?